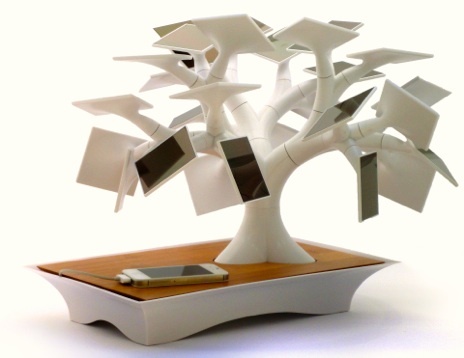 A customizable tree sculpture in the form of a Bonsai tree and with photovoltaic panels in the place of leaves is used to change devices through a USB connection. Solar energy is tapped by the photovoltaic cells and he electricity produced is stored and is used accordingly to charge devices such as mobile phones, tablets and other devices that will soon be in market. A French company, Electree, following the trend, for a better and efficient world we live in, has developed an innovative indoor tree sculpture which has solar panels in the place of leaves. The tree can take different shapes due the fact that its assembling pieces, they come in different modules, are flexible and can be connected in various forms. This innovative tree sculpture has 27 photovoltaic panels which can be put in different orientations so as to capture the maximum of the sunlight available in the area that the 16inch ( 40cm ) tree will be put. This solar collecting tree is purely for indoor use. The solar energy collected by the photovoltaic panels is stores in the battery which is found in the base of the Bonsai tree sculpture. Charging of devices can be done using a USB port which is connected to the battery. So what do we achieve with this innovation? We definitely save energy. The solar panels use the energy from the sun which is a renewable green energy source. So the innovation uses green energy, stores it in a battery and then this energy is used to charge our electronic devices. The tree can decorate your office or house and depending on the needs you. It is certainly an innovative way to save energy, save money and promote green energy.